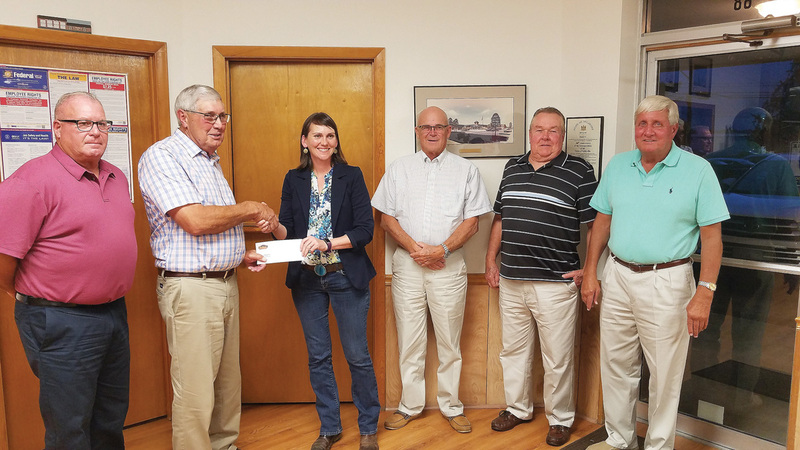 Amanda Irwin presents the Selbyville Town Council with a $210,000 check from Mountaire Farms, covering about half of the anticipated cost of Railroad Avenue culvert repairs. On Sept. 10, the Selbyville Town Council approved a $395,250 project by Hopkins Construction of Bridgeville. Town staff had made some phone calls to garner State and private funding for this major project. Town officials said they were grateful to receive $200,000 from Delaware Department of Natural Resources & Environmental Control (DNREC) Drainage Section, plus $210,000 from Mountaire Farms, whose Selbyville facility surrounds the failing culvert. In 2015, town officials discovered that a galvanized metal culvert was rusting away where the Sandy Branch tax ditch flows under Railroad Avenue. Despite some temporary repairs, the road had to be closed completely. “We’re very excited that this project is going to be completed,” said Mountaire representative Amada Irwin. All the traffic generated by Mountaire’s Railroad Avenue parking lot has been forced to drive south, toward the already-busy Hosier Street intersection, since the road closure blocked their access north to Cemetery Road. “We appreciate that. Now we can go ahead and do that project, which is great news,” said Mayor Clifton Murray. “Sounds like we’re going to get a culvert replacement,” Murray concluded as the town council unanimously voted to accept the bid. Mountaire has also purchased a long strip of land across from its main entrance. So many employees already shortcut though the crumbling property that Mountaire purchased it to make it a safe and legitimate site, Irwin explained. “It would make it easy for us to keep grass cut and keep the litter picked up,” Irwin said. With frontage on Church Street and the corner of Dukes Street and Railroad Avenue, (tax map ID 533-16.15-92.00), paved parking is not the plan for the newly acquired lot. The north end would be covered with gravel to accommodate the frequent car drop-off traffic. The south end would be grassy and park-like, to accommodate pedestrians who already often cross the property for the Church Street shops and eateries. The site would be open in nature, but low-maintenance. “Right now, we just want to get the land cleared” by demolishing the existing two buildings, Irwin said. Town council members gave their blessing for the improvements. • The Selbyville Halloween Parade will be Wednesday, Oct. 24, at 7 p.m.
• The Selbyville Police Department will have to seek another new hire after a recruit did not complete police academy. • Due to clogging issues, the Town hired a contractor to clean and inspect several sewer lines, which includes video camera footage of potential problems. • The State approved an extended deadline for Selbyville’s 10-year Comprehensive Plan update, from September 2018 to March 31, 2019. “We wanted to spend a little bit more time on mapping, land use versus future land use, and we just didn’t want to be crunched for time,” explained Town Administrator Stacey Long. • Selbyville may grow by another 10 acres, as the council will host a public hearing on annexing of Orville Hudson Jr.’s property on Route 17 near Roxana. “This was what the Town was looking for. It’s contiguous to the town and it fits all the criteria. … Most of the farm was annexed already. These are 10.16 acres that need to be annexed back with it. It’d be coming in as an R4, so it would be [zoned] residential,” said Councilman Clarence W. “Bud” Tingle Jr. The public hearing and a possible vote will occur on Oct. 1 at 7 p.m., for parcel tax ID 533-10.00-87.00. • Soon, the Planning & Zoning Commission expects to see preliminary plans for two proposed projects: Schooner Landing (formerly Strawberry Ridge), with 132 single-family lots, a clubhouse, pool and RV/boat parking; and the Warrington property on Route 54, with a 99-unit subdivision. • The council unanimously voted to donate $250 to the Indian River High School Band Boosters for the band’s invitation-only participation in the 2019 Memorial Day Parade in Washington, D.C.
• The United States Post Office will decide if and where to repair water damage at the historic Selbyville site that concerned citizens had noticed this summer. “I’m hoping that things will start moving soon,” said Dawn LeKites of Selbyville Community Club, which first approached the USPS about needed repairs. The Selbyville Town Council’s next meeting is Monday, Oct. 1, at 7 p.m.